Essence specializes in designing and printing professional colourful high quality brochures. Utilizing our large selection of photographs, clipart and fonts combined with our creativity and experience, your company is sure to receive the highest quality brochure. The tangible quality of a printed piece is still a very powerful tool for your companies product/service promotion. And there are certain situations where print is the clear answer: for example; wherever your customers won't have internet or computer access. We have the expertise to carry out your requirements for any printing purpose; whether it's collateral design, magazine advertising, trade show materials, or corporate identity. Your design will be uniquely created to contain your company theme, logo, and colours. You will be provided with design options to choose from. We can provide proofs via the internet. Proofs are provided via the Internet. The concepts will be viewable on a private page located within our web site or will be sent by e-mail. There are many different ways to fold a brochure. Sometimes different is better. Click on the image below to see the many different folding styles available. Learn all the technical terms of printing. 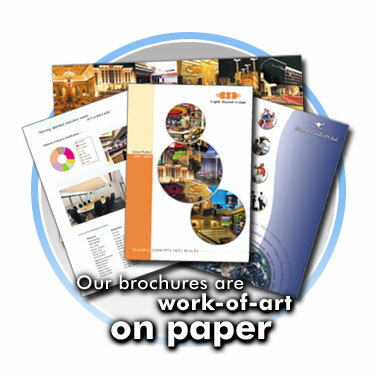 Note: All our brochures are printed on the highest quality Gloss/Matt paper available. They are printed using CYMK full color process. The shipping charges will be extra. For customized orders please Call: +91-11-24336324 or send us an e-mail: info@essence.co.in with your requirements.